Exquisite range of hand woven, Handloom and Khadi Sarees and accessories designed and curated by our Fashion Experts. Hand crafted and hand woven by the artisans and weavers of India. 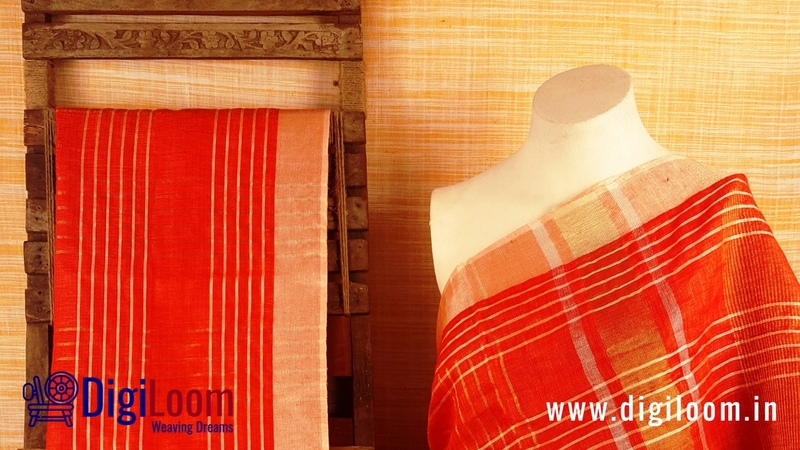 Today, there is a heartening resurgence of interest in Handloom fabric. Handlooms of India in pure yarn provides exclusiveness and customized products. It provides the romance associated with tradition and heritage and a large variety of textile to choose from, ergonomic benefits and a cultural story associated with each handloom textile. Have you ever wondered, what makes HANDLOOM fabric so unique? Here are the list of 15 things you must know about handloom fabric. A HANDLOOM is a loom use for weaving fabric with hand. 2. What is a LOOM? A loom is a device use for weaving fabric. A loom, holds the warp threads under tension and facilitate the interweaving of the weft threads. Weaving is the interlacing of two sets of yarn – the warp (length) and the weft (width). 4. What are the different types of looms? And these looms are mostly located at the weavers houses itself. Yarn is commonly known as the ‘thread’. Hence, a yarn is a long continuous length of interlocked fibers, that are spun with either hands or machines. 6. What is yarn count? Yarn Count refers to the thickness of the yarn in making of the fabric. Thicker yarn are known as coarse counts and thinner yarn as fine counts. The thinner yarn is given higher numbers and thicker yarn is given lower numbers. For example, a 80’s count yarn is thinner than 40’s count yarn. 7. What is hank yarn? A “hank” is a specific length of yarn that is in a coiled form. For example,a hank of cotton yarn is 840 yards long. Warping is a process of converting the hank yarn into a linear form to give the length on the loom. They use huge drums for it. This drum helps in calculating the number of threads and the length of the wrap. 9. What is Street Sizing? Sizing is the process of starching the yarn for weaving. The sizing material adds strength to the yarn and lubricate it to withstand the rigors of weaving. It uses natural adhesives like rice, maize, wheat flour or potato starch for it. 10. What is textures in hand weaving? Hand woven fabric has a different texture from mill woven fabrics. It is due to the low weaving speed and the equipment used for weaving. The thickness and quality of the yarn in the same length and with determines the texture of the fabric. It is these textures that helps in creating distinct handloom fabrics. 11. What is yarn dyeing? Yarn dyeing is a process of dyeing yarn in different colours. It is a crucial pre-loom activity. Dyes are highly colour substances use in colouring of the hank yarn. These colorants or dyes can be natural or chemical. 13. What are natural Dyes? Natural dyes are the dyes that use extracts from nature. It can be from bark of trees, insects, flowers, minerals, rust, vegetables, plants and other natural materials. 14. What are Chemical Dyes? Chemical dyes are the dyes with chemicals. 15. What are Indigo Dyes? Indigo dyeing was one of the first specialty professions in manufacturing of textiles. It does not contains harsh chemicals or toxic metals. It can be use to dye any natural fiber. Now that you know the basics of handloom fabric you can make an informed decisions buying a handloom fabric, textiles or sarees. So what are you waiting for? Click here for exquisite and trustworthy collection of hand woven sarees and stoles. These handloom Sarees and Stoles at DIGILOOM is curated and designed by our fashion experts exclusively for YOU. WhatsApp YOUR NAME to +91-8181999998 for Offers, Discounts & latest Updates! !